HourMinds 2017 is a wrap, and we’re still reeling from this year’s amazing lineup of brand leaders, thought leaders and content. More than 300 of the industry’s leading HR, Recruiting and Talent Management experts came together in Charleston, SC for Snagajob’s can’t-miss annual conference on the biggest hourly workforce trends, best practices and next-generation ideas. If you couldn’t make it, we’ve got you covered. Scroll down to see the five most important takeaways today’s HR leaders and Recruiters should know coming out of three days, 10+ hours and 25 sessions worth of amazing content. 1) Gig economy: Here to stay or passing fad? The challenge of the Gig Economy for HR professionals and multi-location brands lies in the hiring volume, compliance and scheduling complexity it adds. Which brings us to HourMinds takeaway #2. Drugs, FMLA and Workplace Investigations. Scary, but it was a real HourMinds 2017 session, led by leading U.S. employment law firm and Snagajob partner, Ogletree Deakins. HR professionals increasingly face more and more workplace regulations and complexities … which are being met with more and more scrutiny over enforcing compliance among government agencies. Ogletree covered controversial topics like how to deal with weed and the workplace and the rising trend of workplace investigations. Today’s HR leader in restaurant, retail and hospitality workplaces is faced with the huge responsibility of ensuring compliance in organizations that have decentralized hiring processes, hiring managers who have no HR training and hundreds of locations … each with potentially its own set of unique laws. In fact, Ogletree cited 16 states with Ban the Box laws and an additional 150+ individual cities, municipalities and counties with their own regulations on the subject. We’ll be posting Ogletree’s full session recording soon, and it’s one every HR professional concerned with compliance can’t miss. Candidate experience was a big theme this year and a trend no one saw going away anytime soon. The opposite, in fact. This trend is crucial to increasing both applicant volume and applicant quality across all of your locations. 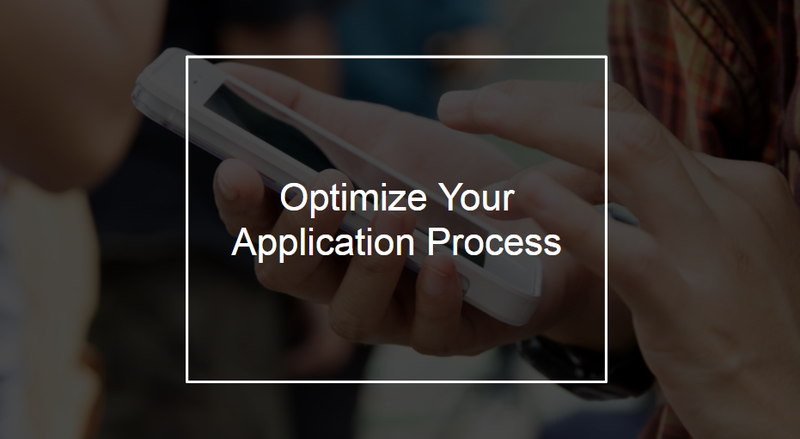 And with 82% of hourly job seekers searching for jobs from their phones, how mobile-friendly your application process is plays a huge part in how great your applicant experience is. Look for talent acquisition platforms that offer mobile-friendly job postings and job application that make it quick and easy for candidates to find and apply to your jobs from their phones. Check out our recent ‘Mobile Job Search’ blog for more tips on optimizing your applicant experience for mobile job seekers. Turnover rates and costs have been climbing the last few years, and HR leaders are feeling the pressure (and bottom line impacts) of turnover rates that are back to reaching historic highs. 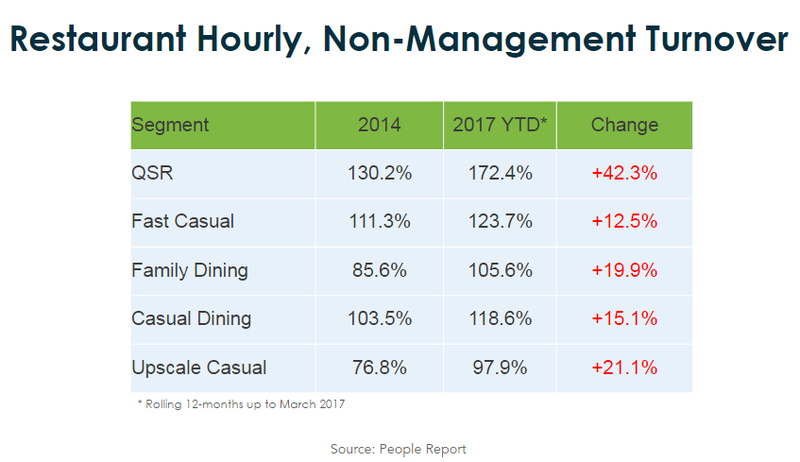 TDn2K presented restaurant industry data on the rising trend over the last 3 years, and, as you can clearly see in bright red from the chart above, hourly turnover is up across the board—up 42% in the QSR segment alone. How much each leaving employee will cost you is up, too. TDn2K placed the cost of replacing each hourly employee at $2,490 and each restaurant manager at $15,271. Getting ahead of why employees leave is crucial to attracting high-quality candidates, retaining top performers and increasing same-store revenues. Integrate industry-leading screenings like assessments and background checks into your hiring process to ensure you’re putting the right people in the right jobs upfront. Even an outstanding candidate will be unhappy and unproductive in a role they’re not a good fit for. That’s a wrap! Check back for more great HR/recruiting-related videos, insights and highlights from HourMinds 2017 that we’ll be posting over the next few weeks. And we can’t wait see you at HourMinds 2018!